Живея близо до планината Витоша и всяка сутрин и се любувам от прозореца си. Обичам просто да я съзерцавам с чаша кафе в ръка. Гледам я и не мисля за нищо, а се опитвам да чуя нейните звуци. Обичам я всякаква – и мрачна, и тучно зелена, и гола и пуста. Просто я обичам. Обичам я през лятото, когато е тъмно зелена и те приканва да я посетиш и да се насладиш на тишината и прохладните ѝсенки. Дапоседнешна някоя поляна и да се оставиш слънчевите лъчи да те галят. Обичам я през зимата, когато изглежда като поръсена с пудра захар след първите снегове. Или когато е потънала в мъгли и облаци и е обвита от вихрушки и само от време на време показва заснежените си върхове. Тогава те са силни, стройни и могъщи и те карат да се чувстваш някак малък и незначителен. Обичам я и през есента, когато сякаш за броени дни тъмно зеленото се сменя с топлата палитра на жълтото, червеното, кафявото и охрата. Тя плъзва по склоновете й и уверено си проправя път към самият връх. Обичам я и през пролетта, когато от тъмна и посивяла започва да се раззеленява и да се обвива с мирис на нов живот и ново начало. 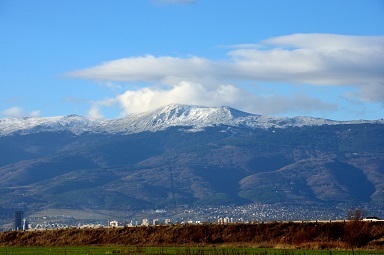 In September I visited mount Vitosha twice. The first time I travelled to Boyanalake and Boyana waterfall. The scenery was amazing. Everything surrounding me was trees and bushes of different shades of green. An endless forest was unfolding in front of me. The only thing disrupting the beautiful scenery was the barely-used path that the people hiking on the mountain made. As I was walking through the trees, the sounds of the city started to fade. The path was difficult, so I had to be really focused on where I was stepping; at times the path consisted of big rocks, at other times there was only soil and at other times I had to grab the roots of the trees in order to pass because the hill was incredibly steep and there was no ground to step on! So after almost an hour of hiking I was exhausted and started wondering whether it was worth it, but once I got to the lake I had my answer: on the right side of the path, a huge lake was being revealed through the leaves of the bushes and the trees. The trees were almost forming a perfect frame around the path and suddenly this frame was disrupted by the magical view of the lake and the blue, sunny and welcoming sky. At the banks of the lake there was a tree trunk where I could seat and admire the view. There were a lot of little fishes and frogs in the water! Right next to where my left foot was, a frog came and sat. It was keeping me company as I was having my leisure time. At the opposite bank, I could see slightly to my right the peak of the mountain covered in dark green, and between it and me there were dozens of really tall trees which must have been over a hundred years old, most of them were of the same height. Next to them there were shorter trees of a lighter color and at the places where you couldn’t see trees, you could find bushes. I am nostalgic of the sun’s rays touching my face after passing through the little spaces between the tree leaves. It is wonderful up on the mountain. After sitting for a while at the lake, I continued my trip to the waterfall. The path became more difficult to follow, as at some places you couldn’t distinguish it from the rest of the forest. As if no one had ever set foot there; pure nature. At some places the hill became incredibly steep to climb and the path was really narrow. I even had to stop and wait for some hikers who were returning from the waterfall because more than one person couldn’t pass at the same time. Once I approached the waterfall near enough to hear the sound of the water and feel its humidity, the path started consisting of rocks of various shapes and sizes. The trees were fewer and fewer. As it started getting more and more difficult to pass through them, at some points I found myself using all four of my limbs to pass! And there it was, the waterfall! 20 meters tall, surrounded by mountain rocks and a few sparse trees. When I finally managed to take my eyes off of the waterfall and see on the other side, there was a pretty view of the city in the distance. I climbed another 10 meters to go as near the water as possible. There, I found a rock big enough to lay on and take it all in: the lack of the city’s sounds, the lovely, sunny weather and blue sky without even one cloud, the portrait of the city looking as distant as possible and the feeling of belonging there. It was a wonderful experience. As I am typing you this letter, I am sitting at my desk in my room, next to the window. When I turn to my left and gaze outside, I see the mountaintop behind the yellow building which is, too, surrounded by trees. I am nostalgic of that wonderful morning I spent in the nature and I can’t wait to do it again! I hope many more mountains are going to follow.